« Delicata Delish – the answer to your squash problem. Earlier this week, we received a giant box in the mail and inside was a tiny cello, not much larger than a viola. 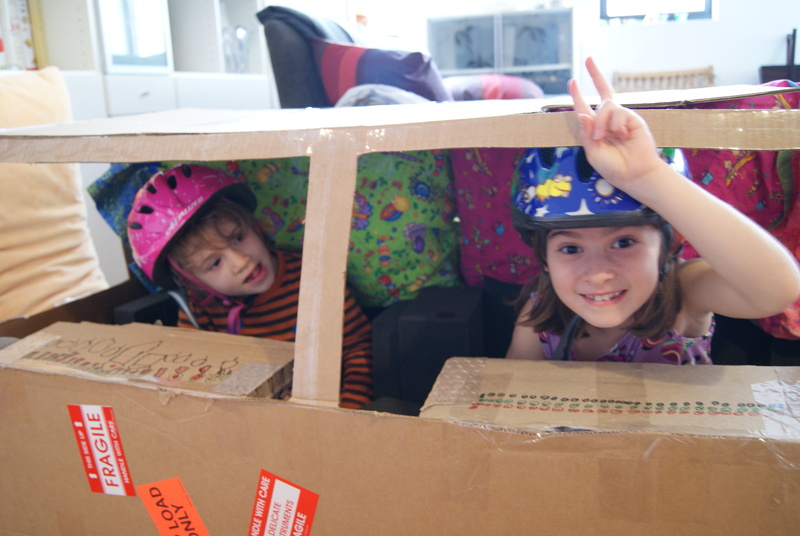 The box took up most of our living room, but before breaking it down, the girls decided to make a spaceship out of it. Complete with control panels, walkie-talkies and helmets. It trumped all other toys this weekend and almost prevented attendance at a birthday party. It reminded me of one of my favorite children’s books, “Not a Box”, by Antoinette Portis. Nothing like the combination of a weekend and a giant box! This entry was posted on November 7, 2010, 10:39 pm and is filed under kids, make. You can follow any responses to this entry through RSS 2.0. You can leave a response, or trackback from your own site. So, so cute. I have so much domaphile reading to catch up on!